Home » Medical Books » Download: I’ll Carry the Fork! 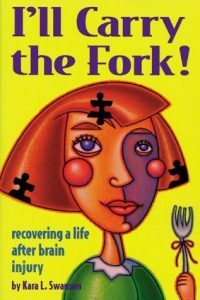 This book has become a staple for brain injury survivors, their families and friends as well as in healthcare related college courses through the years. In January 1996, a van speeding through a red light ended the life Kara Swanson had known. She suddenly joined the 2 million Americans who suffer brain injury each year. It was like being thrust into a foreign country with no map, no way to speak the language, no directions home.